WanderMan: And The Lord Said..."Let There Be Low Power Light"
And The Lord Said..."Let There Be Low Power Light"
L.E.D. lighting is a hot thing for RV's right now. Well, it's a hot thing everywhere really. L.E.D. stands for "Light Emitting Diode" a kind of solid state light source. They generate much less heat than a convention hot filament bulb and use far less current to do it. The perfect thing for RV use. 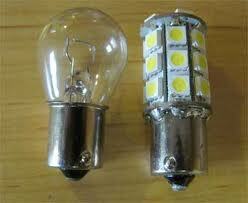 There are multitudes of regular, old fashioned 12V bulbs in use in any given RV. Wedge bases, Pin bases, Screw in bases, Festoon bases, Bayonet bases...the list goes on and on. There's also the old power consumption champion, the fluorescent bulb. Every one of them can be replaced with a L.E.D. version. That's where the choices begin, cool white, warm white, day light. Direct bulb replacement or flat plate, stick on style. Lumens, output, power, etc. For me, I like the Warm White versions. Their color temperature is between 2700 and 3400 Kelvin. The lower the number the more "orange" in color the light is. The average regular bulb is around 3200K. While they put out slightly less light than the Cool White or Bright White versions I find it's more pleasing to look at. Especially when replacing regular bulbs or halogens. If you want a "bluer" light, more like daylight, then by all means go that way. Many people feel that it's a better task light. I agree it is better to work (and perhaps read) with a daylight (5600-6300k) bulb. It is much easier now to find an L.E.D. bulb that has the same light output, measured in Lumens, than the original bulb. Any way you look at it L.E.D. bubs will significantly reduce your power consumption over incandescent versions. They also generate a lot less heat for a given amount of light. After replacing most of my incandescent bulbs with L.E.D. versions I started to look at my fluorescent fixtures. Most of these have 2 bulbs per fixture and are of the T5 size. They do vary in length usually from 12 to 21 inches. On the ceiling of my RV are two 14" twin bulb fixtures. They use 1.4 Amps each. 2.8 Amps is a lot of power when the other fixtures with LED's draw less than 1/10 the power! Yes, the fluorescents put out a lot of light (400 Lumens per fixture) but I found a way to have my cake and eat it too! Enter L.E.D. strips. 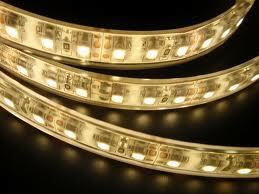 5050 SMD L.E.D.s mounted on a flexible strip (waterproof or not). You can cut and trim these to fit in your fixtures or other locations. They put out A LOT of light: They have self adhesive peel and stick backing. I'm still coming up with creative places to install these. It's going to be hard to NOT turn my RV into an old style disco! I decided to add these strips to my existing fixtures AND leave the fluorescent bulbs in place. I'll add a same-type rocker switch to the other side of the fixture so I can choose which one (or both) to activate. Cost. Most L.E.D. bulbs do cost more than the existing old style bulb. However, they do last much longer and the benefits in power saving are large. If you are hooked up to shore power that may not be as critical to you as say, the folks that prefer boondocking. For example, the 5 meter (15 ft) roll of 5050 SMD L.E.D.s that I received cost around $28. I used about 10 feet to supplement all my fluorescents. Pretty much on par with the cost of the fluorescent bulbs. Another example, the BA-15R bayonet base led bulb was around 29 dollars, much higher than a regular 1141 bulb if I wanted to match the light output of the existing bulb. MUCH less expensive if I went with a slightly lower output. I'm currently in the phase of converting at least one of my old mini-bulb fixtures over to florescent. Due to the lenses being crystal clear plastic and having the narrow blade-style plugs, I haven't located an attractive looking LED alternative. While I do have newer fixtures in a box that would be able to use the standard round plug style as you have shown, they are narrower based than the original fixtures in the camper and subsequently would leave ugly spots on the ceiling exposed, requiring me to go to the florescent as the low power replacement. 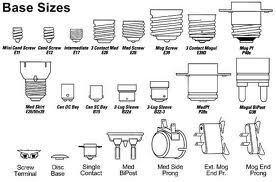 Can you send me the numbers off those fixtures and bulbs, I have several sources that may have something. I've found replacements, but because of the crystal clear plastic, they're all rather unsightly. The current fixtures use bulbs that are about the size of quarter. The bulbs have no metal base at all, simply a couple of wire leads in the glass that goes into a plyable socket that holds them in place. You could try steel wool to slightly abrade the clear plastic and make it translucent. There is also a spray used in photography that does the essentially the same thing, but is removable. P.S. yer more than welcome to send me yer old 14" fixtures (If they're the dual tube models), they're about the same size and likely close enough vintage to most of what's in my camper now. Were the LEDs you bought the self-adhesive ones? You know, you can cut and arrange the appropriate number of LEDs inside your old incandescent fixtures, without buying those $29 direct replacements, right? I figure there're about 18 LEDs in that bayonet base replacement but you might do with a few less. Just take out the old lamp and wire in the new LEDs. Search Amazon. So far, I haven't been able to beat the prices there. A lot of the 5 meter spools are less than $20. Any color, any K rating. My article talks about self adhesive and panel mount LEDs as well as direct bulb replacements. The strips were self adhesive. The rest of my replacements are just bulbs with bases to match the existing bulb. The cheaper strip style LEDs are usually 3726 SMDs which are smaller and have less output than the 5050 SMD elements. Amazon simply collates pricing from MANY vendors. You can often search a bit deeper online and find the same stuff at a lower price. Amazon sometimes has the lowest price, but not always. It pays to search.....you gotta love the internet! 1. Don't rely on a manufacturer's description of cool or warm white. There is no industry standard as I was told by one manufacturer whose "warm white" was closer to the white version above. You need to look at the kelvin scale. 2.Lumens Lumens Lumens! Most lights that I replaced the incandescent with LED I was very disappointed with the lumen output. In some instances the LED that a manufacturer said would serve a specific purpose were only 1/4 as bright lumen wise. 3. Takes some getting used to. The light quality is different from LEDs compared to incandescent. To my eyes they seem more glarey. I found the reading lamps almost unusable at the beginning but now they are tolerable. I was most happy with the LED replacements for the halogen puck lights under my cabinets. I happened to get some with more lumens than the halogen and they are operate very much cooler than the halogen. If you convert good luck to you. Wow...you must have had some bad luck. I re-did all the incandescent lights in my Class A and spent around 110.00 dollars. You may have MANY MANY more than I do, but you can get them as low as 2 or 3 dollars for small bulbs (for eyeballs) up to 14 to 28 for large bayonet bases. 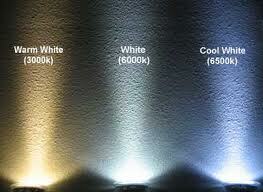 Most manufacturers display pictures and comparisons of the color temperature. If they don't, I would be wary when (and if) buying from them. Many of the less expensive options involve shipping from overseas. On MANY occasions these are the same bulbs marketed in the US and sold for twice (or more) the price. As always do the research and then buy. Absolutely! I am still surprised and glad when I look at how slow the batteries deplete compared to having all "regular" bulbs! what 12v heater fan are you using? thats something I'm considering getting and weighing 12v vs propane. link? We switched to LEDs last winter in Quartzsite in preparation for going solar and boondocking. The first one we bought was bright white light that really hurt my eyes. It's fine in the bathroom or outside porch light. We then bought warmer light ones which are wonderful! They give us more light than we had with the 1141s, don't bother our eyes at all, and don't melt the light covers. We haven't finished going solar yet but they sure have helped save battery power when we have lost power a few times at RV parks. I'm a believer as well and prefer the warm white style of bulbs. Not burning/melting the light covers is a great side benefit! I was researching LEDs and found an article that explained that the less expensive bulbs have internal electronics that make the bulb suitable for a single voltage, e.g., 12V. That's fine if they are powered by a plug-in transformer that puts out a constant voltage, but in an RV in which voltages can range from 11-ish V to 14+ V, the LEDs' output will vary with the voltage and at the higher voltages will get too hot and die early. That article stated that the better LEDs will show that they are suited for a voltage range such as 9-16 V and they put out constant brightness and have adequately sized heat sinks to provide the life. I'm looking forward to replacing my 1141s as soon as I can! In the past, the less expensive imported LED replacement bulbs dies quickly if fed a diet of multiple voltages (10.5-15v) that can happen in a typical RV scenario. None of the ones I have purchased within the last 3 months or so have exhibited ANY odd behavior or heat issues when running at various power levels. As always, YMMV. Much of the info online is designed as a marketing tool rather than straight facts. If I have a failure due to voltage variations, rest assured i will let everyone know! Looking to change out my halogen bulbs, 12V 10W CE. I see them on Amazon but don't know where to start. They say not for 12V us a LED transformer, not an halogen transformer. What's this? I think they are G4 base, small two leg, like they have pictured on Amazon. My other question was heat. They are enclosed in their fixture, with a glass lens the only thing showing. How's the heat in ficture and is this something to worry about? There are three fixture with different type of bulbs, T912, and they are not enclosed completely so no risk of them getting too hot. Cone shaped glass fixtures. Ken 912 Bulbs are wedge bulbs. LOTS of choices here for LEDs. I usually go on ebay, do a search for 912 Warm White LED. Should be a snap...and cheap too! I only have 3 of the T912. Easy. I was looking for an answer mostly on the small halogen, with what I think is the G4 base. Without actually seeing the bulb size and base..I couldn't hazard a guess. There are MANY G4 base LEDs out there...if you can figure out what the wattage and bulb number is on the halogen (or match up the photos of the LEDs size-wise) you should be OK. Cozy Nights By The Fire. . . In An RV?